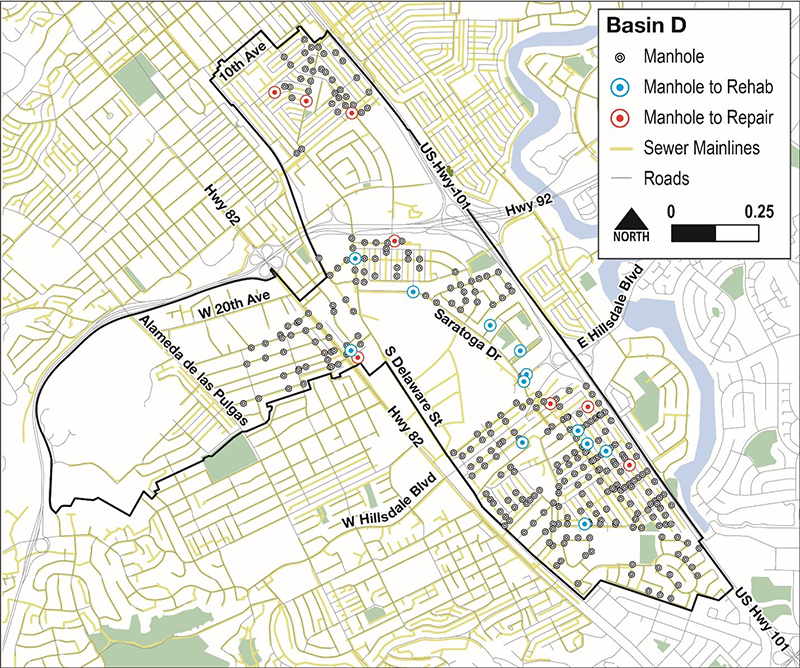 San Mateo’s storm and wastewater collection system is made up of a network of 240 miles of pipe divided into a series of five major sewer basins. Basin D includes the area south of State Route (SR) 92 and southwest of Highway 101, with a smaller portion extending to the north side of SR 92. The work in Basin D will occur at multiple sites, some within the public right-of-way. Approximately 60% of the sites are in easements on private property, including yards, backyards, and driveways. Basin D serves as the collection system for public and commercial centers, such as the Peninsula Golf & Country Club and the San Mateo County Event Center, as well as several residential neighborhoods. 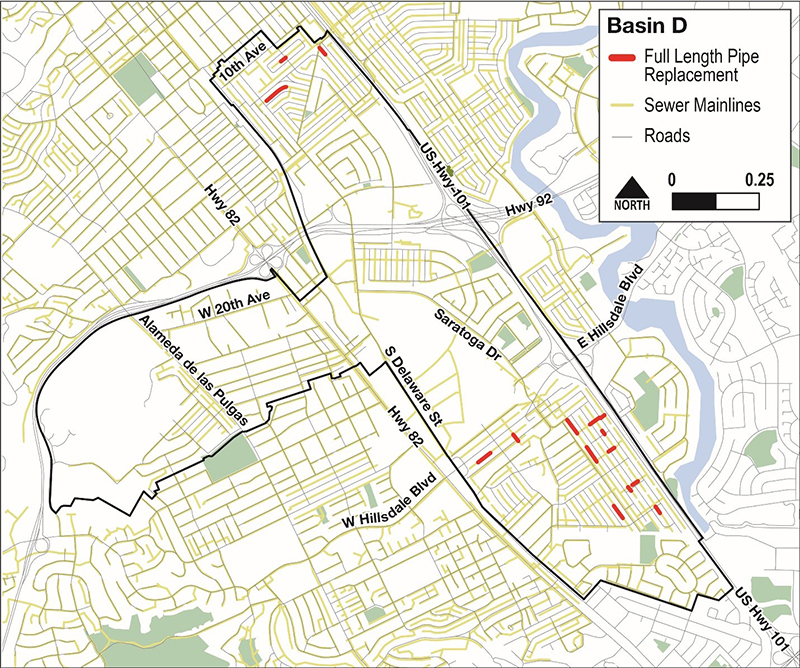 The purpose of the Basin D Sewer Rehabilitation project is to upgrade and rehabilitate aging pipes and manhole covers. Cracked sewer pipes and laterals allow outside rainwater and groundwater to flow into the sewer system. Faulty manhole covers also allow outside water into the system. Improvements are needed to ensure proper operation, repair leaks to meet regulatory requirements, and prevent high flows that can result in sewer overflows. A condition assessment was the first step toward finding cost-effective and technically-feasible fixes to minimize inflow and infiltration (I/I). Closed-circuit television (CCTV) studies were conducted using a remote-controlled camera. The information was analyzed to identify problem areas in the collection system and to design spot repairs without the expensive guesswork associated with digging blind. Gravity mains offer reliable movement of sewage and surface runoff through a sewer system. However, over time the ground can shift, roots can penetrate, and traffic can impact sewers causing them to settle and crack. During this project, our contractors will spot repair damaged or displaced existing 6-inch, 8-inch, 10-inch, 12-inch, and 15-inch gravity sanitary sewer pipe with new polyvinyl chloride (PVC) sewer pipe at 315 locations. In these locations, existing 6-inch pipes will be replaced with 8-inch pipes. In several other locations, existing 6-inch pipelines will be fully replaced with new 8-inch pipelines. Manholes need to be easily accessible for sewer maintenance and related emergencies. Over time, manholes can become covered with grass or can sink below the grade level of lawns, roads, or sidewalks. 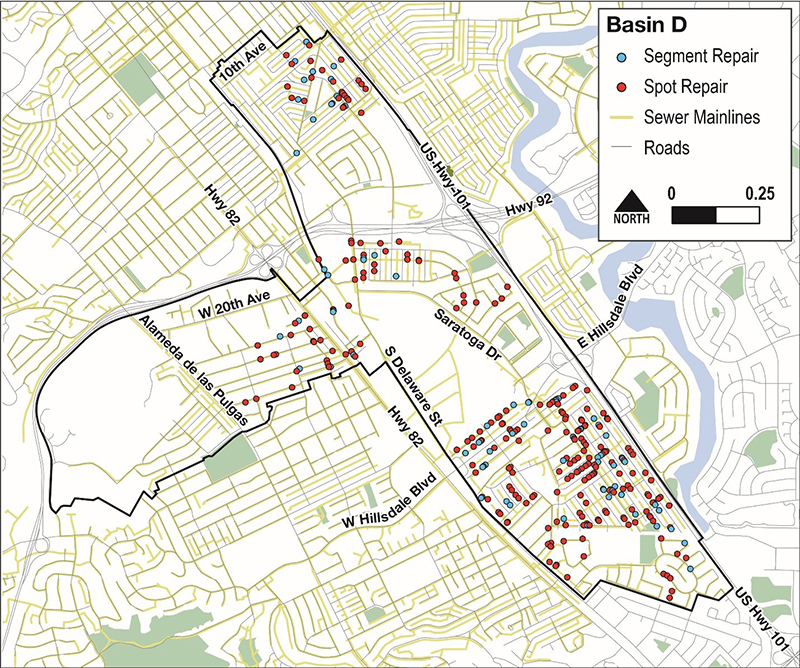 In total, 21 manholes in the basin have been identified for repair or replacement. There are several methods of rehabilitating manholes, and the method selected for a job depends on the condition of the manhole. Common rehabilitation methods used for projects such as this include: 1) replacing the frame and cover, 2) applying cement mortar as a binding agent to the inside, and 3) applying epoxy liner to the inside for resurfacing.